Have you ever considered packing up your bags and moving yourself to another country, or perhaps all the way to the other side of the world? Whether you are seeking a sea change, a move to the mountains or to a country with a completely different culture, don’t worry you are not alone! I think Australians (and a lot of Brits) are born with itchy feet and a desire to see the world and immerse ourselves in different cultures, religions, cuisines and experiences. The biggest question most people have is just how much it costs to live in another country, compared to where you are from. I’ve lived in Australia, the US and the UK and Dan moved from the UK to Australia with me so we have some kind of idea about how much it costs to live in other countries. We also recently discovered Netflights.com who have created an amazingly helpful calculator which allows you to see how your spending habits and lifestyle compare to those in the most popular expat destinations around the world! 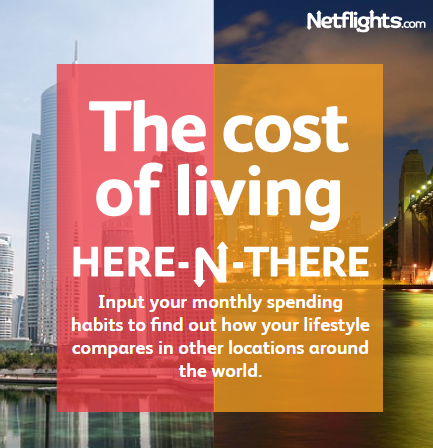 Netflights’s Cost Calculator gives you the opportunity to input your monthly spending habits to discover just how your lifestyle compares to other locations around the world! So all you need to do is input the numbers and it gives you an outline of how your spending would compare to a life abroad. A lot of people dream of taking the plunge and moving to another country (whether it is for a few months or indefinitely) but they just don’t know how their financial life and expenses would pan out in another country. That’s where the Cost Calculator comes in! Based on my answers, Dan and I actually spend more in Australia than we did when we were living in the UK but luckily our wages are a lot higher here in Australia so we actually come off better living in Australia. Based on the results of the Cost Calculator, it seems we would financially be best off living in Canada and worst off living in Dubai or China. Canada is a country that Dan and I have always wanted to visit and one I would happily spend a few years in if the opportunity presented itself and now that it looks like we would be best off financially there… it very well may happen! A lot of people say that the cost of living is very high in Australia but I actually felt that the cost of living in the UK was higher. A few things that I found to be higher in the UK were the cost of petrol (double that to Australia), the fact that we had to pay so many fees to rent (whereas in Australia the landlord pays all the fees) and the cost of car insurance and public transport. On the other hand, groceries were a lot cheaper in the UK and so were items such as alcohol, clothing and some of our utility bills. I personally feel that our lifestyle, cost of living and quality of life are much better in Australia than it was in the UK. Whilst I loved everything about my years living in the UK, I honestly feel we are better off in Australia and neither of us would change a thing! Have you ever moved abroad or are you considering the expat life? It can be an incredibly daunting to move to another country but if you know what to expect financially it will make the move a lot less stressful and a lot more exciting! Be sure to check out the Netflights Cost Calculator to help you crunch the numbers! This post is brought to you in collaboration with Netflights.